Playing airsoft can be a fun and exciting past time. With the right equipment and skill, players can dominate the field of play. If you are looking to up your game, or tend to play with several people at a time, we’ve got the perfect idea. Let us introduce you to the airsoft grenade. Yes, similar to a grenade in the military, an airsoft grenade is designed to launch multiple bb’s at the same time into a large group of enemy players. If you are wanting to do some substantial damage to the enemy’s numbers, and are willing to take a little time to plan and prepare, the airsoft grenade will become the best weapon in your arsenal. 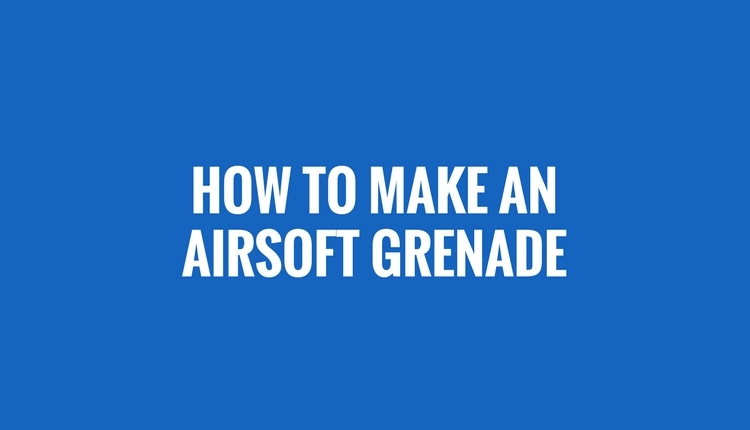 However, there are several ways you can make an effective airsoft grenade. It is up to you to decide which method works for you and your team. As a disclaimer, never build an airsoft grenade without adult supervision. Get a plastic Easter and drill a large hole in the end that already has a hole. Make sure the hole size is big enough to snuggly fit your firecracker. Place a small firecracker (generally a m90 is sufficient) into the newly drilled hole, ensuring the fuse is on the outside of the egg. Fill the second half of the egg with 6mm bb’s. Don’t worry about getting the expensive ammo; the cheap stuff will work just fine. Close the egg and secure it with tape so that the egg doesn’t come apart in transit. You now have a usable airsoft Grenade. All you do now is light the fuse and throw the grenade. Remember, the fuse will burn quickly so only light it when you will immediately throw it Keep in mind, this is one of the more dangerous types of airsoft grenades so use extreme caution while building, moving, and using the grenade. This variation of the airsoft grenade is perhaps the easiest to form. Follow these steps for a quick and easy weapon. Load approximately 50 6mm bb’s into a water balloon. Using a speed load and wrapping the opening of the balloon around the funnel portion of the loader will speed up this process. Add roughly 10ml of water. Using too much water will not allow the ammo to fly through the air. Blow the balloon up with air to nearly the breaking point. It is a good idea to have eye protection on when doing this, just in case you put too much air in it. Tie the balloon off and you are done. This variation will bust upon impact with the ground, or any structure, causing the bb’s to fly towards the enemy. Most of us, at some point, have made a “Works Bomb” where you put tiny balls of aluminum foil in a plastic bottle, add in toilet cleaner, and secure the lid to the bottle. The mixture of the foil and cleaner cause a chemical reaction that produces gas that quickly fills the bottle and explodes. This type of airsoft grenade uses the same principal, but is considerably safer. Fill a zip lock bag about 1/3 full with vinegar. Next, add in you 6mm bb’s. There is no limit to how many bb’s you can add. However, do not feel the bag full. Take a paper towel and shake baking soda in the middle of the towel. Then fold the corners of the paper towel to completely cover the baking soda. Complete this step only when you are ready to throw the grenade. Place the paper towel containing the baking soda in the bag, seal the bag, and throw it. The baking soda and vinegar combining will create an expanding gas that will burst the bag, sending the bb’s flying. The key to this airsoft grenade being successful is ensuring that the seal on the bag is completely closed so that the gas cannot escape and the bag will burst. Remember, when building your airsoft grenade, always have an adult present and never, under any circumstances, throw the grenades directly at the opposing player. Instead, aim for the ground near the enemy, allowing the grenade to be effective but ensuring nobody gets hurt.